$7 Draft Cocktails STOP #5 – Pure Lounge – 1326 U St. NW – 7-10pm DJ 1st Floor – DJ Nobe – Dirty South DJ 2nd Floor – DJ Shablast – 90’s Hip Hop and R&B Specials – $5 Miller Lt., $7 Ciroc STOP #6 – Amsterdam Lounge – 1208 U St. NW – 8-11pm Femme Finale Afterparty DJ Miss H.E.R. DJ Reets DJ Lalee Specials: $4 Beer, $5 Punch Don’t drink and drive. U Street Cardoza Metro and Metrobus stops are along the bar crawl route. Lyft, Uber, Via, and Cabs are all around. 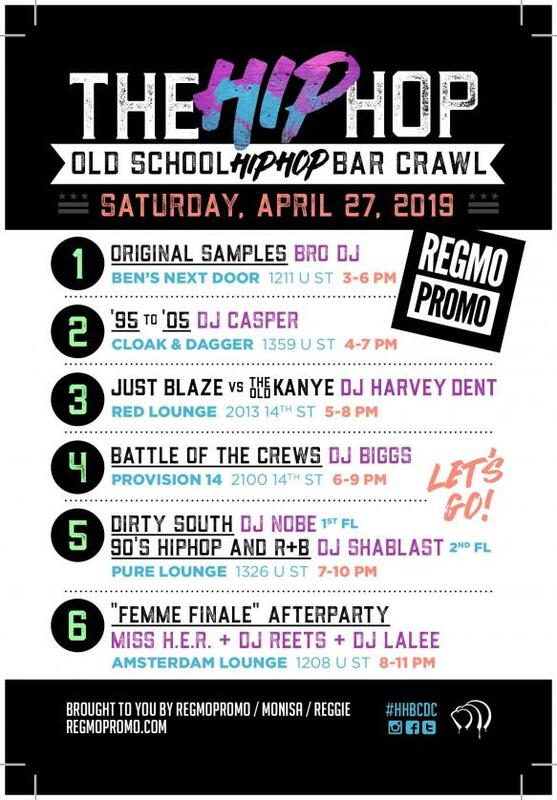 Brought to you by RegMoPromo Follow us at www.regmopromo.com IG: @regmopromo #hiphopbarcrawldc #hhbcdc #regmopromo Facebook event link: https://www.facebook.com/events/385085322320207 Eventbrite event link: https://hiphopbarcrawlspring.eventbrite.com RegMoPromo reserves the right to use any photograph/video taken at any event sponsored by RegMoPromo, without the expressed written permission of those included within the photograph/video.